Update: Bates Motel set. September 2016. Production built the roof for the second season. 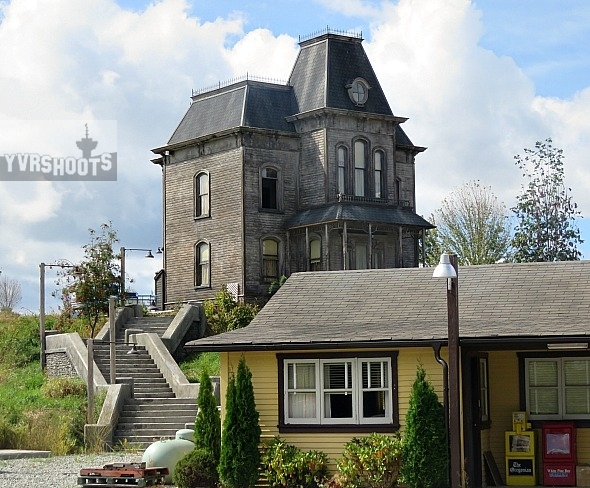 The Bates Motel set out in Aldergrove on 272nd Street near the U.S. border is the spitting image of the motel set in Alfred Hitchcock’s horror classic Psycho, except for the missing top of the Bates house which will be CGIed in post-production. When I arrived mid-afternoon to see A&E’s upcoming series filming, only Mike Vogel’s deputy Sheriff seemed to be inside one of the motel rooms. When he crossed the road from set on his way to craft services I apologized for misidentifying him in yesterday’s blogpost about the Steveston shoot on the fishing boat. 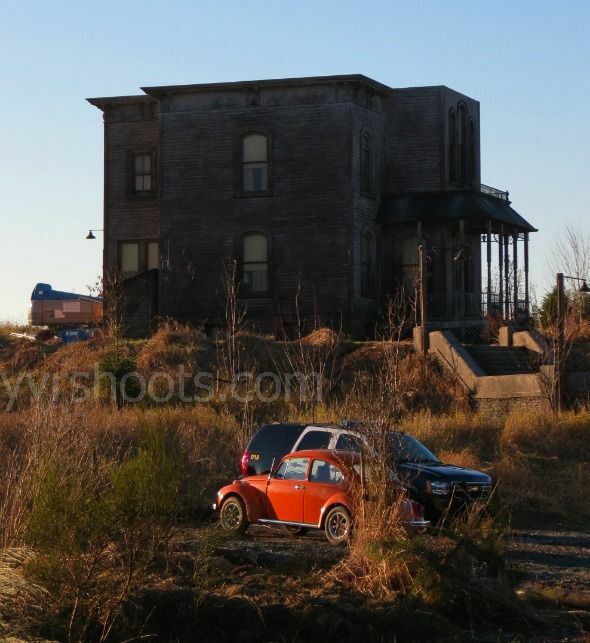 If I’d stayed in Aldergrove I could have seen the Bates house on the hill lit up for a night shoot by a light on a hoist near 272nd Street and a balloon light in the garden It would have looked scary as hell but I had to start heading back to Vancouver. This set is such a long way out that this will have to be my one and only visit unfortunately. A&E’s contemporary Psycho prequel Bates Motel focuses on a younger version of Psycho movie killer Norman Bates (Freddie Highmore) in present-day Oregon and explores his relationship with his unhinged mother (Vera Farmiga) as he approaches his evil destiny. Lost co-showrunner Carlton Cuse penned most of the 10 episodes which are described as a cross between Twin Peaks and Smallville. 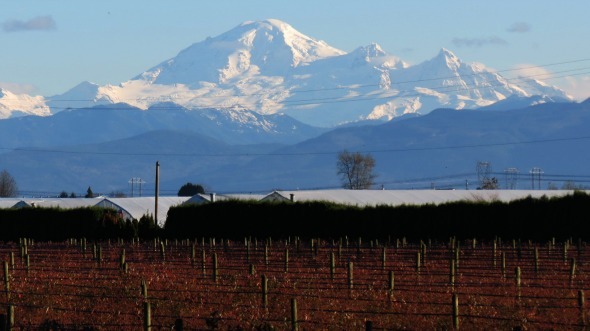 View of Mount Baker in Washington state, taken up the road from the Bates Motel set. Does anyone know when they start filming season 5? And if the site is open for visit if I drive by coming from Vancouver? And also the exact address of the location?? That’s where it was. Since torn down. It has a roof now. CGI-ed roof in first season and then built one in the hiatus before the second season. Dunno how I missed this page earlier… the pictures look familiar, so I must have visited it but not read your intro. It’s a shame that I didn’t know you were out here for some shots, we could have chatted at the Craft Tent (which gets set up in my front yard). I could have grabbed you a couple of pictures of the house at night, if you needed them. Ice bombs of vehicular death made me laugh ruefully. It’s so true about the Port Mann Bridge of Doom. Thanks for the tip. I’d love to come out to see the set again before Bates Motel wraps its first season. Will see if its possible. I have over a hundred shots of constrution of the site. I have night as well as day shot of the action on the set. I live very close at 0 Ave. and 272nd. I got Nikon D7000 cameria and another small cameria , I love taking pictures. do you care to share your photos ? you didn’t mention a website where they may be seen,…. also, where exactly is the house located ? my brother lives in Vancouver and wants to whip by and see it in real life. Any real address or can you give a cross street ? I live in Seattle.. wouldn’t mind making the couple hour drive to check it out.. is it someting you can just drive by? .. pull over and take some photos? The show is fantastic and I’m thinking it could run several seasons and would like to see it before it gets a little too popular and even more difficult to visit. Any info on visiting would be great! Yeah, its right on the West side of 272 Street in Aldergrove, just north of 8th ave. Just make sure that if you *do* decide to pull over and take pictures, that you’re not blocking either of my driveways… we have big trucks coming in and out, and the drivers are not too keen on dodging people (and the mess those people leave on the bumpers is so hard to clean off). I haven’t been to the Aldergrove set this year but I hear that it is boarded up and fenced off so I’d suggest waiting until Bates Motel starts filming season two. But if you want to have a look sooner it’s right on the road at 272nd Street & 9th?? Avenue. You can’t miss it. It was a local attraction on weekends last fall but the one and only time I visited was during the week when they were filming and I approached on foot, walking for several blocks to set. That’s probably why they let me stroll by during a break. thanks for the reply guys! You mention “boarded up”.. I really am thinking I might make a little road trip of it on Friday(4-26)… will I see anything? Or did they really block any possible visibility? I really look forward to heading up and checking it out… weather will be in the 70’s on Friday! Plus I’ve been up to my eyes in work since December.. first time to escape. The house has plywood over the windows. The Motel has poly covering the entire front from the roof to the ground. The stairs have a “tent” erected over them to protect them from the elements (they are not real concrete, so are at risk of damage). The entire site is enclosed inside 2 chain-link fences (one main one, and then a second fence around each building). The drive is nice, the area is real nice, and if you see a green deck-truck towtruck drive by, feel free to give me a wave (I’ll try and make sure not to aim for you). The best place to park is just South of the hotel, on the West side of the road… there is a pull off that will make sure you are not blocking the road any, and will put you on the same side of the road as the site (no dodging cars). Just make sure to not park in any driveways, and don’t stand in the driveway with the big orange cone (I can’t see people standing there when I leave from that drive). Also don’t go inside the barricades (taped off area) on the site itself, cause 1 of the security on-site is very “by the book” on that and will yell at you. Other than that David, have a safe drive up. That’s what you can expect to see. Thanks a ton for the info and the pics, I’m looking forward to it even more now. Just too bad I won’t see Vera! well..maybe next time. Also if you happen to recommend any good local restaurants in the area let me know.. and again thanks for the detailed info! Yep Bobs Bar & Grill has awesome burgers, located on Fraser Highway (about 2.5 miles North) at the 27000 block, on the North Side, across from the bowling alley. They are very welcoming of film crews there, so we try to send business their way as well (tell them Quirings, pronounced like inquiring without the in, sent you). There is also a White Spot at the Best Western on 264 and Fraser Highway, and a few dozen pizza places. But I personally say go to Bobs. So I made it up there.. pretty cool to see.. once they start shooting again I might cruise back up.. although getting through the border wasn’t too easy, after bringing me in for a search and 20 questions and apprehensive looks and as well a thorough search of my car I made it through, barely.. and yeah wow it was literally 3 minutes from the border! Security guard dude was walking the perimeter and gave me a nod.. I took a few pictures and enjoyed the scenery for a few mintues then proceded to Bob’s for a fantastic Mushroom burger and a Coors light! THanks for the recommendation! Then.. It was dusk.. almost dark on the way back through and cool to see the set in the barely visible creepy lighting. I’m assuming they don’t do the interior shots in the house?.. or maybe they do and thats why it’s boarded up so well. Funny they have the Hitchcock profile on the front as well. Anyway.. thanks for all the info! ITs on 272 between 16 ave and 8th ave in Aldergrove you can drive by it most of the time except when there filming they usually block off the road. I drive by it once a week on my way to get gas in Lynden. Hey where is exact the address so i can get close to the set??? The original Psycho house on the back lot at Universal Studios was built to two-thirds scale to make it appear much higher and much farther away from the Bates Motel than it really is. Is this new set built to scale or to full scale? The new set is built full scale not two-thirds scale and it looks so like the movie set that it’s spooky. 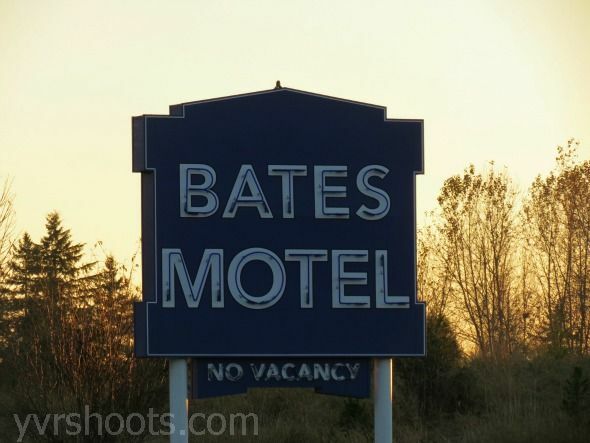 We really miss the Bates Motel house and motel here. 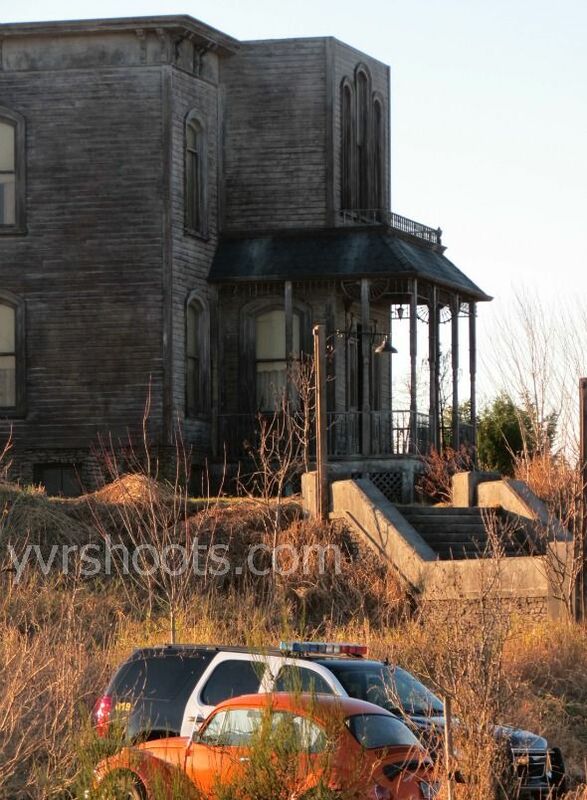 The sets were torn down when Bates Motel series finished filming at the beginning of the year. Does anyone know when they are going to start filming Bates Motel again? Heard from someone who works on Bates Motel that they might start production on the second season earlier. Maybe as soon as July. When they were wrapping for the season, the asst locations manager was mentioning that we *should* know by mid-April if Season 2 was coming along, and then would begin to see signs of activity by the end of May (prep-work). Since then, they have been pretty on-par with that scheduling. There have been some trucks parked by the North driveway a few times over the past week, which I am going to take as an indicator that they are going to start getting ready to bring down the fences and poly coverings soon, and clean up the set. Hoping to see something more going on soon. Really miss the activity around here. 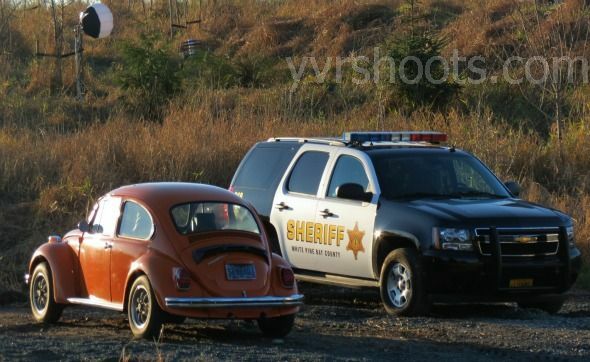 Bates Motel Season 2 is going to begin production as soon as if not later than July 13th of 2013. Same characters, same sets (obviously) but in the office there is talk of building the roof on the house because of some slight inconsistencies with the CGI work (i.e. the size of the attic oval window in the front of the house) and some shots where they try to avoid the roof and you not noticing the roof is not there when clearly you should see it). Also, the interior sets are shot in Universal Studio except the window shots. They are filmed inside the full scale house. More ideas from Hitchcock’s original piece “PSYCHO” (1960) will appear as well, like Marione Crane’s vehicle from the original film and some original (cleaned-up) score as well as camera angles. that would be great if they added the roof! Also.. must be some serious timing,scheduling and traveling to be shooting this in several locations. Would think it would be cheaper to furnish the house and shoot there rather than renting at Universal studios and flying back and forth.. I’m just a dental technician though .. what would I know! Anyway they do a great job. Actually, they were using soundstage G at Vancouver Film Studios (identified by the large “Save BC Film” banner hanging on the side facing Hwy 1) for a lot of the interior shots, not Universal Studios. http://www.youtube.com/watch?feature=player_detailpage&v=O9Ai0G2JJPU#t=87s will show you what the inside of the house actually looks like. There has been talk of putting a roof on the house for season 2 since before season 1 even started (Abraham and Cofi would often joke that once the show got its second season, I would get a house with a roof to look at). The people from California came North to BC, not the other way around (they came up to do promo shots for commercials and stills, and complained the whole weekend about the cold and rain). Any info on Bates Motel Movie after the series end 2017 will be the last season too bad it is a excellent series! We saw today that they are adding a roof for the new season and painted the motel. Yeah, they’ve been banging away over there all week (a lot of which was to reinforce the structure of the house, since it wasn’t designed to actually have a heavy roof on it). Already told the crew that I would be filming the actual hoist of the roof (barring any emergency tow calls, of course). I’ve been waiting for the roof since they first assembled the house, no way I’m going to miss that. I’ll check with the crew tomorrow and see when the actual “hoist date” is going to be… but I would imagine that since they are pretty much done with the pieces, it’s just a matter of waiting for the crane to show up. PICTURES AND VIDEO ALSO. LOVE THE SHOW SAW THE WHOLE FIRST SEASON. CAN’T BELIEVE YOU LIVE THAT CLOSE. AWESOME !!!!!!!!!!!!! They are taking down the inner fence today. Aug 7 2013. shooting should start at the beginning of nextweek. Things are looking good at the set and all is spruced up , for the new season. Bus stop is up, the sign is there (still crated) and shooting starts on the 14th, with 2 days of filming next week (14th and 15th). 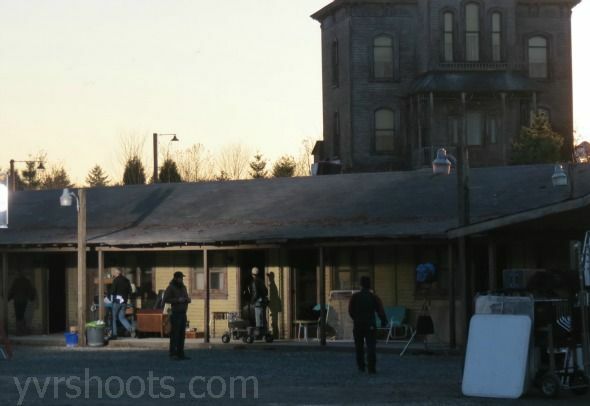 Glad filming will start on the new and improved, new-roofed Bates Motel set this week. Wish I could be there. Your photo of the new roof was the best I’ve seen. Great shot. Wish I could have sent along some shots from the actual roof raising. Shooting starts tomorrow morning on 8th Ave between 264 and 272 (8th will be closed all day), then Wednesday and Thursday at the House/Motel, with off-and-on road closures on 272 between 8th and 16th. Remember to let me know if you do venture out to this side of the bridge at some point. GETS SOME REALLY COOL PICTURES. SEND ME SOME OF THE MOTEL. July 17 2013 the roof is on house this morning , I missed it being lifted on but got a picture of crane. The house sure looks better with the roof on. Can someone please post a link of the roof on the house if you have it? It’d be super cool and I’m super curious to see it! Scott White took a wonderful photo of the house with the roof on from 272nd Street. 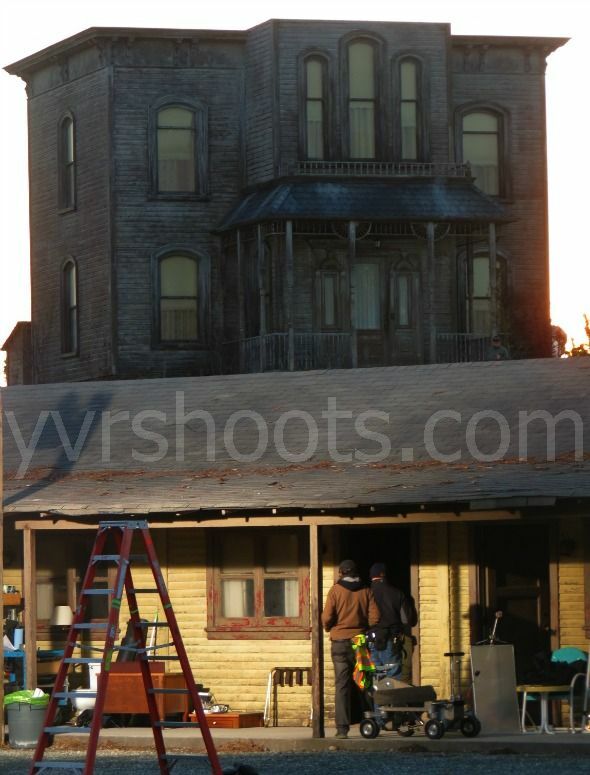 Here’s the link http://yvrshoots.com/2013/08/your-shoot-bates-motels-gothic-house-gets-a-new-roof.html#.UgWcr9JJNqg. Fixed the link. Loved your photos. The color is so fantastic. Wow the place looks great! I’m so out of the loop. I just found out about the set and the show and had to see the house. I’m a huge Hitchcock fan Shadow of A Doubt and Vertigo are my faves but Psycho is number 3. And I always go out of my way when I travel to go to sites where his films were made. Cycling into Bodega I couldn’t help but note all of the birds on the power lines. Wondered if they were real or placed there because of the movie. Going to check out the show and try to break my NT Times crossword addiction (which is why I have no idea of what is on tv . Alfred Hitchcock would be proud! When does season 3 start filming? Is it visible on Google Earth? Can you please post GPS coordinates? @Dave: If you punch in coordinates 49°1.249’N 122°28.259’W and start with your date selector at 11/3/2011 you will see the before… slide it up to 9/29/2012 and you can catch post-construction (stage 1)… jump it ahead 1 more to 5/5/2013 and you have the set right before they started unwrapping it for Season 2 filming (still no roof). You won’t get a shot with the roof on Google Earth until they do their next set of shots, unfortunately. On a side-note, you can see that I really need to do some tree trimming… damn Google Earth. @Scott: They just announced Season 3 renewal yesterday… schedule for shooting won’t come out for a couple of months yet. Rumour on set from the crew was that the producers were looking to a late start for Season 3 filming, to give the same appearance and feeling of Season 1 (darker, colder)… so we expect filming to start somewhere around September. Nice! I thought that more recent satellite images had to exist somewhere. But Google Earth pulls up a 2008 image by default and I wasn’t aware of the date selector function. Very cool. Thank you for posting! Hi guys, I am a huge fan of Bates Motel. When I knew Bates Motel was being filmed just outside of Vancouver I got so excited. I live on Vancouver Island, but I am sure willing to go to Aldergrove to see some of the filming. Do you guys think it´s possible to come close and have a peek, maybe take a few pictures too? I would be able to go some time on the second week of October. Would they still be shooting? I would think they are if they start filming in September. Yes they will be shooting in October. Is the show filming now? Al: Shooting is scheduled to begin on the 15th… which means they should be doing some filming across the road a week or so later. This thread is awesome guys, fantastic info. I love this show and its way cool how they totally nailed the look and feel of it to the original movie. Scott, thanks for being the eyes on the ground so to speak…. The fence is down again and they are cleaning up the yard! They are getting ready to shoot season three now, lots of action at the site.. I just went there today. No fences! All the vehicles from the show were parked out front too. You missed all the filming though Sara… they are done with the set for the year (unless any reshoots happen to come up). The past few days were bad for some unnamed and egotistical Paparazzi showing up though, and being verbally abusive to the crew. Police were called on a few occasions, which made things in the area a little more tense. It actually was probably better for you to roll by on the Saturday when no activity was going on. I went to visit the site a few nights ago (probably not the best to go at night) but I couldn’t really find my way we we turned around and headed back to van. We plan on going again soon during the day. Just wondering, if we are headed on 272 street from 8ave towards 16ave, where exactly do we turn? is it a right or left turn? and how long will we have to walk to reach the set? Any info you could provide me with would be awesome! You just turn left off 8th or if you come down 16th you right. cool and oh so spooky! Don’t for get the new season starts March 9th on AE. channel 31 on shaw. We will be spending a couple of nights in Vancouver in July. Is it worth the drive? Big fans of the show. Nov. 30 2015 they are filming today! According to a tent boy. Plywood is off the windows, some equipment was parked at the Aldergrove site yesterday, but today its moved. The cars are there. To whom it may concern, we would like to use the house as a background for a photo shoot. We tried N.B.C Universal studios No one would help, and couldn’t give us any leads .as to where or who to talk to. Please help if you can. 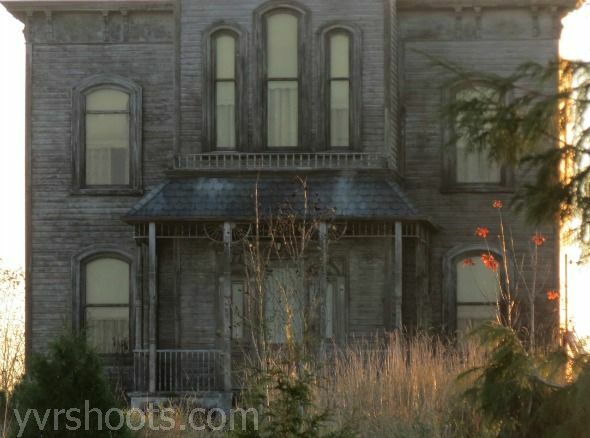 It’s unlikely Bates Motel production would let you use the house for a photo shoot. Security chases away locals who stop and take a few snapshots. But the place to try is the production office batesprodofficed@gmail.com. When does season 5 start filming?? I live in Vancouver and would love to go especially for an evening shot! Sept 8th the fence is down the tarps off the stairs and the boards are off the windows. Looking like something will be happening shortly. I think this will be the end after season 5,my wife and I love this show, have watched all the seasons 5 or more times, I hope it won’t end but we think this will be the last season. Rihanna recently posted a pic of instagram w a caption “when u bout to check in #marioncrane”. her insta is badgalriri. you could check out the photo. i believe this indicates that shes in town for shooting. 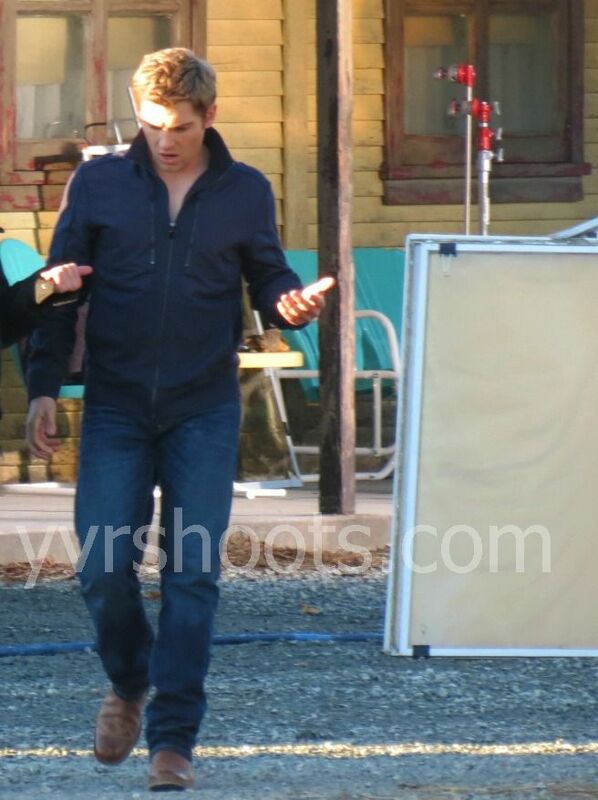 yvrshoots do u have any updates or information about bates motel shooting? Hi, does anyone know where they film the scenes in the house? I understand that there is nothing in the house, so where do they film the house scenes?? Film the house scenes on sound stages at Vancouver Film Studios. Had massive sets of bedrooms, kitchen, stairs. They are taking the site down they have filmed 50 episodes, at 10 pure that’s another 5 years. were you work on the set?